The IndiPRO Tools 47PPC 16" 2.5mm to 2.5mm Cable is designed to work with optional select IndiPRO Tools POWER POD systems. The cable is 16" long and polarity tested with the optional POWER POD systems, so you don't have to worry about crossed polarity when powering devices. 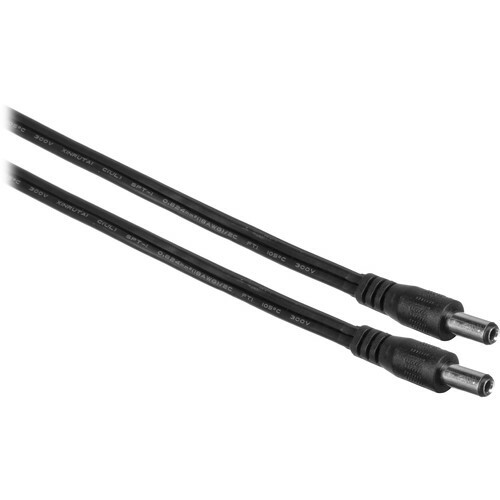 This 16" long cable features a 2.5mm coaxial power connector on both ends of the cable. Although you can use this cable to connect optional power solutions with a 2.5mm connector to power your device, the cable has only been polarity tested with the optional IndiPro Tools POWER POD Dual & Quad LP-E6 (7.2 & 14.4 volt) battery mounting plates. Please note that this cable is not power regulated and will pass whatever voltage through it that you connect the cable to. The cable is rated to handle 19 volts at 5A. Box Dimensions (LxWxH) 4.8 x 3.4 x 1.3"